The Fisker Karma S is a concept vehicle from two California-based companies  Fisker, and Telsa  that have generated excitement around their electric vehicles. 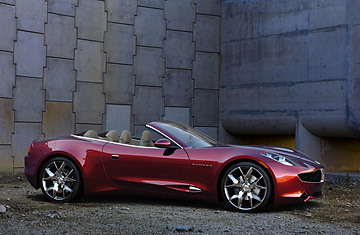 The Karma S is described as the convertible version of the roadster Fisker unveiled last year. Like the roadster, the Karma S is powered by a plug-in electric drive system that stores power from a wall socket before its unplugged from the grid and let loose on the open road.